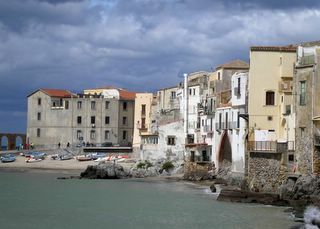 If you ever have the chance to visit the pretty little town of Cefalu (chef'-a-loo) on the north coast of Sicily, don't go WITH ME unless you have an umbrella, Goretex coat, polar fleece jacket, and waterproof shoes . . . I have been there three times, and every time it has been horrible, rainy, cold, no-good weather. I also carry this curse in Switzerland, so don't go there with me, either. Actually, I've been to Cefalu four times, but I don't count the first one because it was just a "drive-through" in Kendra's 4WD Chevy. The only thing I saw that time was a very close-up view of the walls of buildings as we managed to scrape through without losing her only remaining exterior mirror. If you do happen to go there in fair weather, which they MUST have sometime, you will probably love this quaint, cute, charming little seaside town with its polished and patterned cobblestone streets that is nestled beneath a huge monolithic rock formation . . . something like a Sicilian "Stone Mountain." 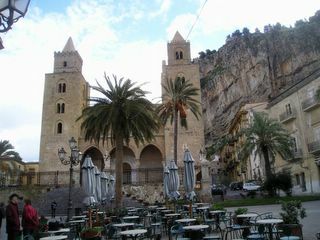 I think that next to Taormina, Cefalu is the most beloved tourist destination on the island. One might see why if one had good weather . . . The beach is part sand, part jagged-looking black rocks that have been shaped into bizarre shapes by the waves. Colorful fishing boats lie face down on the sand. Fresh fish is served at Cefalu's many excellent restaurants. Like the rest of Sicily, this is not expensive to enjoy with a bottle or pitcher of Sicilian wine. An underground river provides clear, clean water in the medieval washing area which has been preserved with its stone washboards. Clothes were brought here to be washed and rinsed. The strong flowing river then washed the dirty water out to sea. You can almost imagine this early laundromat as a popular gossip center. Walking up to the main piazza and the cathedral, if you're not being beat on by rain, you can admire the buildings with the mixed architecture influenced primarily by Arabs and Normans, Arabs. Wrought iron balconies are works of art on each one, even when draped with the inevitable Sicilian laundry. Wandering up and down the streets is probably very pleasurable in warm, dry weather. There are hundreds of photo ops. The cathedral is one of my favorite Sicilian churches. Built in 1173, it is a fortress-looking building that is saved only by a unique combination of Norman architecture and Arabic craftsmen. The interior has the old, flat wooden ceiling, but the apse above and around the altar is spectacularly decorated in Byzantine-style mosaics. Yes, more mosaics! Like Monreale, there is a huge Christ Pancreator (see photo in Monreale entry) looking down from above. The mosaics are remarkably bright and lovely. We see the Virgin Mary, the apostles, saints, prophets, and archangels. In keeping with the Arabic influence, heaven above is depicted in Islamic style! Other details of the cathedral also carry this influence, which makes for a very unusual Catholic church, indeed. As an added bonus, you can stay dry and relatively warm while you are inside. Keep that in mind. 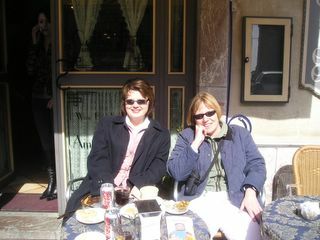 Maybe you know, Helga and I have made a tour through Sicily in April (last year) with a group from Ansbach. We visited the whole island, and, of course, we were in the Villa Romana del Casale. We saw these wonderful and very well preserved Roman mosaics. They really are great but not the only one we've seen. When you say, they are the best in the world, this reminds me to the biggest trees in the world. I have seen three of them. One is the "General Sherman," a big redwood in the Sequoia National Park in California. The next one was in Mexico. It was a huge water cypress, also the biggest tree in the world and finally the "Father of the Forrest" in the Kauriforrests on the northern island of New Zealand. Do you know, that a famous poet from Ansbach, a certain Mr. von Platen (you know we have a "Platengymnasium" here in Ansbach) died and was buried in Syracuse. You will find his grave and a stele in a small park, opposite of a very modern church (sorry, I forgot the name). If you ever come to Palermo and especially to San Monreale (close to Palermo), you should know that King Ludwig (the one whose big picture is above the right altar in the Ludwigskirche in Ansbach) is buried there. As you seen, Ansbach and Sicilly seem to be very close! P.S. Say hello to all "Salvatores"! The Stammtisch smiled about the nice story about your water problems. That's Sicily! My impression of Sicily? I l-o-v-e-d it! 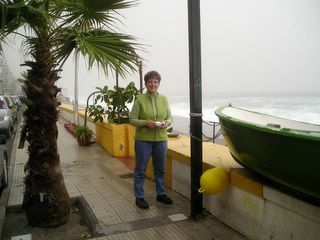 I so enjoyed Sicily's endless coastline, the rugged mountains, the rolling fields, and the breathtaking Mt. Etna. Its history and architecture are evident as you travel the island. Was it what you expected? Sicily was as I expected it to be to a point. I did not expect to see so many Greek and Roman ruins. There were so well-preserved. FABULOUS!!!!! What suprised me about Sicily was the way people drive.I l-o-v-e-d it all . . . from the delicious Sicilian dishes and the wonderful wine to the Palace of Biscari in Catania, the Villa Romana del Casale, Mt. 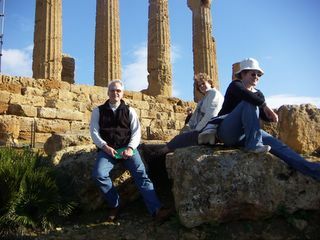 Etna, Agrigento and the Valle dei Templi, the 3rd-century BC Greek theatre in Taormina, the brightly colored ceramics in Caltagirone, and hanging out with Maryellen, Pete, and Repeat in Nicolosi. Would you come back? AbsolutelyWhat would you still like to see or do? Wherever Maryellen would like to take me. 1. First impression: Everything is bigger than we expected. Sicily is an island (Duh! ), but the water around it seems to have increased its expanse and interest. Even Maryellen's horoscope while we were visiting -- "you don't have to live on an island" -- seems both funny (yes you do have to live on an island) and appropriate, because Sicily is so big in size and culture. 2. Surprised: Three things: First, the preservation of the ancient history, despite being under constant influence/attack from outside forces. Second, how the outside of buildings look like prisons and the insides are so lovely. Lastly, how people live in Nicolosi with an active VOLCANO at their doorstep! 3. We really enjoyed the Roman Hunting Lodge Bath Mosaics. It was probably the Disney World for adults of the ancient world. After a tough gladiator match -- "I'm going to Sicily!!!" 4. Yes, since we survived the "suicide lanes" and traffic circles it appears that we are fated to return. We still have to see Palermo and sights out west. Thanks for hosting us and Gwen -- it was a super trip! Joan and I will have a Captain Morgan special and limoncella!